Half of the time we are four. But when we are four, we are sometimes two and two. Occasionally we are two and one. Sometimes we are just two. Confessions of a Psychotherapist, a site I discovered via Dave Hill, has lots more to say on the art of being a step-mother. I have often, particularly on a Sunday, met groups of negroes, elegantly dressed; and have been sometimes been amused by observing the very superior air of gallantry assumed by the men, when in attendance on their "belles", to that of the whites in similar circumstances. On one occasion we met in Broadway a young negress in the extreme of the fashion, and accompanied by a black beau, whose toilet was equally studied; eye-glass, guard-chain, nothing was omitted; he walked beside his sable goddess uncovered, and with an air of the most tender devotion. At the window of a handsome house which they were passing, stood a very pretty white girl, with two gentlemen beside here; but alas! both of them had their hats on, and one was smoking! The difference between trendy Brighton and staid Hove, as defined by PooterGeek... Brilliant. Voters and interested parties around the globe hear everything the President or the leading contenders to succeed Bush say. You can no longer say one thing for domestic consumption and another for a foreign audience... Now for a spot of special pleading! Candidates for the Presidency might want to rethink how they deal with the foreign press. No-one expects McCain or Clinton or whoever to grant the same level of access to the foreign press they reserve for the NYT or WaPo, but a little more consideration and tact would go a long way. One of the more dubious aspects of West End theatre-going - apart from the overpriced tickets, cramped seats, crowded bars and interruptions from mobile phones - is the time-honoured tradition of quoting critics' reviews out of context in publicity material. By wrenching the words around, producers regularly make a silk purse out of a pig's ear. But, as Stage blogger Mark Shenton reports, an EU directive is winging its way towards Shaftesbury Avenue. Max Bialystock, your days are numbered. Are my ears deceiving me? An even-handed and nuanced programme about anti-Americanism? I missed the first instalment of Justin Webb's R4 series, Death to America, but just caught up with the second, an examination of what people in Latin America - and especially Venezuela - think about Uncle Sam. Sharp intakes of breath from the radicals as our man with the microphone asks awkward questions about whether hostility to yanqui power is sometimes a smokescreen for local failures. Excellent, thought-provoking radio. Webb has spoken up on this subject before, as you may recall. He'll be reporting from Cairo next week. As soon as I have a free moment, I'll listen to the first programme as well. I meant to post this on St George's Day, but as I've already explained, things have been hectic around here. That quintessentially English artist, Stanley Spencer is the subject of an affectionate tribute in the arts festival on my home patch, with dozens of local painters creating a gigantic, open-air reproduction of one of his late works, Dinner on the Hotel Lawn. I think he would have liked it. You can see the original - held at the Tate - if you click this link. Norm Geras saves you the bother of wading through Naomi Wolf's jeremiad about the slow drift towards fascist dictatorship in America. I had tried reading her piece, and gave up at Warning Sign Number 3, which tried to equate bone-headed Republican activists with the Brownshirts. While some observers like John Bolton declared that, in the crisis, Ahmadinejad "scored a political victory, both in Iran and internationally," the facts suggest just the opposite. First, note that the Iranian press did not even mention the crisis for several days after the British sailors were seized: This was hardly a case in which the regime was trying to whip the public into a frenzy. On the contrary, it seemed to downplay the issue. 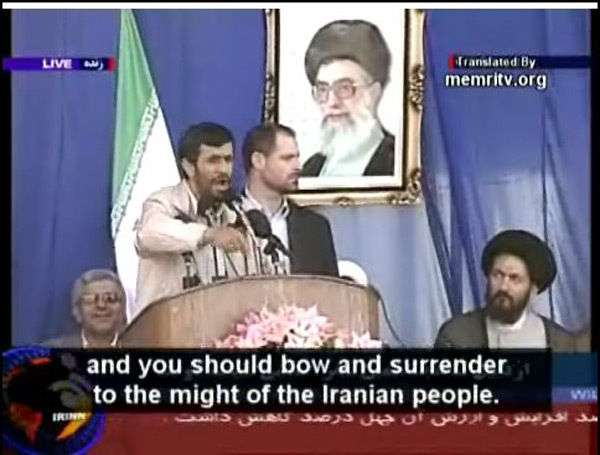 Second, after the release of the sailors, Ahmadinejad was roundly criticized in many Iranian newspapers, with several articles making the point that the crisis cost Iran greatly without any corresponding benefit... It is hard to escape the conclusion that Ahmadinejad was a loser in the crisis, and that other Iranian leaders decided they needed to cut their losses. The most important is that, notwithstanding Ahmadinejad's declarations about the irreversibility of the nuclear programme... the issue of Iran's nuclear future is not resolved. It is not ultimately in his hands or the hands of the IRGC [Islamic Revolutionary Guard Corps]... In the classic terms of statecraft, the sticks need to be potent enough to concentrate the minds of Iranian leaders on what they have to lose; and the carrots need to be offered at the point when Iranian leaders are both looking for a way out and an excuse for taking it. Are we artful enough to do both? The surprise morning release of the 38 sailors and marines ended a tense three-day standoff between the British government and a breakaway Lutheran militia group that controls large swaths of the notorious "Manure Triangle" region spanning Iowa, Minnesota and Wisconsin.